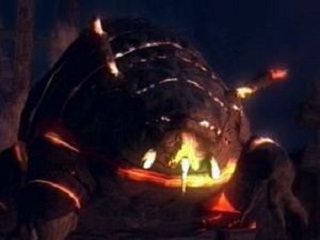 Large Bearbug is an Enemy in Demon's Souls. Large Bearbugs are much bigger than the Bearbugs and Flying Bearbugs. Jumping body press. Distance is about the 'Bug's entire length. Thrusts its needle-like appendage from its head. Charging attack. Breaks most guards. If you have the spell Soulsucker, get near one and kill it instantly.